It does what it is suppose to and that is to let me send my receipts in with an expense report and to get reimbursed. So far so good. I like most things about this app. It makes life easy while on the road saving receipts etc. The only reason I didn’t give 5 stars is the airfare booking portion doesn’t work well. The hotel and car rental booking work fine just the airline. It wants exact times not Morning or evening. And without exact times it has “no results”. I was able to go into the booking webpage and find flights no problem. Mild inconvenience but if Concur could make searching for flights easier on the phone app portion it would be a 5 star app. My company recently painfully implemented Request. We had to come o terms with the fact that the app does not support Request, except as an item to be approved. People are coming at us asking why they cannot book trips anymore via app and why they cannot expense their trips by linking the trip Request IDs to the requests. Basically unusable and a heavy downgrade. Would like some feedback on this if possible. Submit button at bottom - not good. All new added and expanded features are great. More functionally and Ana similar access as the webpage. But I’m the expense report the huge blue SUMBIT button at the bottom is not great. You can press it by mistake and have to recall the report. Switch it with the “+” at the top right. That’s where it should be. So that you only use it once a month. And the add expense at the bottom so you can use one hand to add an expense or just a quick picture of a receipt. A little confusing at first but after a few minutes I was fine. Inability to cancel/change reservations limits usefulness of the app. 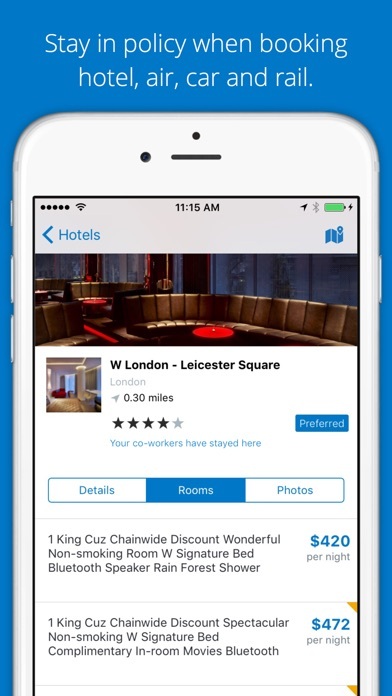 It is cheaper to book hotels direct and have much nicer accommodations than the app. The app is good for expense reports but horrible for booking travel. Very easy to use so fa. This app is very user friendly, first time using and submitting a report was simple, awesome!! Can you please build in this capability? Thanks! Great way to complete and approve expense reports! No more keeping paper receipts. Quick, simple and easy to use! This app use to be insightful and useful. Ever since it became SAP, it is bug ridden and managing expenses is nonfunctional! The categories fail to show, majority of international expenses never show, and then there’s the phantom expenses... what’s odd is that everything is ok via the website. Have taken multiple pics of receipts. Analyzed then didn’t upload with any reason given. What’s the point of this feature and why did u break it? Mobile App used to be very handy. With the unneeded updates, I can no longer assign CC purches to expenses. WTH! Stop helping SAP! You are making things worse! App says I have 5 expenses, but only 2 are visible. Awesome! Used to be so easy to use, after rejecting expenseIt app years ago it is now integrated in the Concur app. I see no improvement to expenseIt from the version a few years back. expenseIt tried to be smart but it is not. I would like the ability to remove expenseIt and just take photo’s of our receipts. Our who team rejects expenseIt, it is time consuming and counter productive. I was pleasantly surprised with how easy this process was. I’m not tech savvy and yet I was able to walk through using mobile app. This was my first experience using Concur to submit a reimbursement report. It took awhile—especially because I kept getting interrupted at work—but it was not as difficult as I’d initially thought. I was originally anxious about it. That’s why I kept putting it off. I like it! Two thumbs up! Need to be able to take picture of more than one picture for multiple page invoices or receipts. This is the only app that believes in the mantra if it is not broke fix it until it is. I am disgusted that I am forced to use this app by my employer. Every update something else is broke. Now I cannot even look at the receipts attached to my expenses. SMH. Just leave well enough alone already. I am tired of y’all continually breaking the app and having to wait for a fix to the app over and over. Trust if I was not forced to use this app it would be gone quick. It would be nice if Concur had feature that would pull up or predict based on past business purpose, reason etc.. instead of having to retype each time. Very simple app to use & understand. All businesses should use this App! This app is so slow. If your on the road and trying to maximize your time, this is NOT the app. Well designed and user friendly. One small issue searching expense/project code on mobile errors out. Ever since SAP bought this and started making changes this year or so - major bugs. Not easy to use anymore. It would sure be nice if they would / could utilize location services to populate the place of the expense. Better auto fill would be nice as well. My company has used them for years and I am glad they do. A recent update broke P Card expense report generating from the app. Every new report is a T & L report. I love the app but last week or so it says I have expenses but when I click on list of your expenses it says I have none. I have to get on a computer and transfer them then they show up in the expense report to itemize. This expense report app is fantastic . I love how I can access my camera. It is very user friendly. I love being able to use the route feature for mileage. Happy !! Would like to see the app be able to auto populate the fields from the photo of the receipt. I’ve used Concur before and recall this capability. Occasionally had to correct some fields but it saved a lot of time nevertheless. Very easy to use, make expensing reports easy! The most recent update blew away all receipts. Including reports sent in awaiting approval. Note/beware: do not update the app while you have reports pending! Generally a decent app with good performance. Surprised by several user interface issues and inconsistencies that are in a major app supported by a large company. It’s been a while that these issues have existed. Easy to use, highly recommended! I get all my company monthly expenses done in a timely manner and this helps a lot!!! It is amazing how such a bad app is still in business. I guess since they serve the corporate market, sub standard products are ok. I cannot cancel flights using my app. Have reached out to the customer service team at least 5 times but zero response. I wish we moved away from using this service. Really bad service. No longer can upload receipts to my app on the iPhone with the most recent update. Receipts upload via the app on iPad...but not iPhone. Please send through a fix. Need off airport car reservations on mobile. Perfectly useful mobile app ruined because it appears you can no longer move an expense from one report to another, requiring the use of a PC, which negates 97% of the purpose of the mobile app. It would be great if future updates would allow me to download two versions of the app one one device, one for each of my accounts. Everything is within easy reach of your fingertips. The menus are very well laid out. I can quickly review items within the expense report and review the associated receipts as well. This app has been very well thought out and is very reliable. Never had a lock up at all.I highly recommend this app. So annoying when I type something out and then when I go back to the expense, it’s cleared out and I have to retype it. Happens on both my phones! This is not a user friendly app. Way too difficult to find what to do and there are no instructions anywhere. 7/4/18: latest update didn’t fix the issue. I just looked and personal car mileage is still not there. It was briefly, but after the update, disappeared again. 7/1/18: loaded latest update. Personal Car mileage expense type still disappears. It will come back and then go away again, especially after submitting a report. This is all I use the app for. Is this being looked into? Original review: Where did personal car mileage expense category go? There is one listed with the same number 70420, but no option to put in addresses for the route taken. I tried the app support link, but couldn’t find anything about this. Everything seem to work properly; I really enjoyed the camera feature for the receipts. One drawback I cannot find the spreadsheet for mileage easily ? Super easy and user friendly! Anybody else having trouble with this update version? When creating a report the create button is difficult to see. I have a color vision issue and could not see the text in sun lit area and could barely see it in doors. More contrasting text would help. After I enter in all of the stops in the mileage calculator, it changes all of the addresses, making this app useless for me! Using this app is way better than emailing attachments then uploading in concur. The only issues I have are: 1. I attach a receipt by taking a photo of it, but when I move it to the expense report I get an error indicating no receipt. I then, and I know it only takes 8 seconds to do, I change it to Receipt. 2. In the event you forget to hold on to a $9.63 Panera Bread receipt. It says to indicate comments why no receipt. I put comments in saying "didn't hold on to that minor receipt" or something like that. The indicator is still red which prevents me from submitting which forces me to simply put any sort of image for receipt for it to go through. Probably not the best workaround. All around, really great! Mobile is the Way to Go!!! Mobile app blows the online website out of water. So efficient!!! I loved this app and an update came along and deleted out the ability to track my mileage. Worst update ever! Where is the dark theme ? macOS Mojave will natively support dark theme very soon, iOS will soon follow, but apps must support a dark theme. Will you be proactive like many other great apps and support dark theme now, or be reactive and fall behind. You should be able to save job # once and have it applies to all expenses in the report you’re doing. I no longer dread my monthly expense reports! The Concur app has taken all of the hassle out of creating and submitting my expense reports for work and allows me to quickly snap pictures of receipts to save them and easily create reports on the go! I’m finally getting the hang of this app but it’s taken me several months to do so. It’s not at all user friendly. Even when I make all choices and go to the next level of completing an expense report, I get the big red warning triangle with (!) and it admonishes me that there is incomplete information. Yet, it gives me no opportunity to enter the information up to that point. It seems that there are several unnecessary steps to complete the expense report when it could be much simpler. I’d give 0 stars if I could. Always have issues. Very frustrating. I love the app. When using the mileage calculator it tended to kick me out of the app. Love the App and the ease of doing expenses but hate the update. The new update keeps crashing. Hopefully the next update will work better. It was hard to figure out where the hardstop was before submitting the report. Great phone app to have access to travel plans via mobile. But unable to book and hold a ticket. Congrats concur on showing the world you’re actually dumb enough to make the last 4 updates description the same thing... Maybe you should task your people with actually making updates instead of showing us they’re capable of using copy and paste. Using concur is convenient and allowed me to submit my expenses immediately for a quicker turn around time. This app makes expensing SO quick and easy. Much better than emailing photos of receipts to my computer! Great way to track and itemize your receipts!! Congrats concur on showing the world you’re actually dumb enough to make the last 4 updates description the same thing... Maybe you should task your people with actually making updates instead of showing us their capable of using copy and paste. There should be default values for drop down fields. Expenses should be automatically imported from your credit card linked to the program. The Concor iPhone app should automatically put in the date of the receipt for you. I am constantly in putting the same data over and over again for all receipts. On an intermittent basis, I can’t connect with your platform. There is an Internet signal but no connection. This seems to happen outside continental US. It is easier to attach receipts to expanses using the app than the desktop version. This is a great app. I like seeing all my travel info together. Phenomenal up on the go for business purposes. Consistently driving and on the go with new business occurring every day. Worse app possible when using the IPhone. You have to input data multiple times before it saves to website. Every expense takes 2-3 times the effort with the newest update compared to before! Now it wants to make sure you crop your pictures every single time. Should have kept a version or 2 before this one. Was not this bad before! No longer can review receipts in my app on the iPhone with the most recent update. Having the same issue now on iPad. Please send through a fix as this has continued for weeks. My company used to require paper receipts be retained, taped to 8-1/2”x11” paper, and submitted along with a printed copy of the expense report, via snail mail. With this App, I open it and snap a photo of each receipt as I get them, and they are stored in the receipt store until the charge appears as an expense. No need to retain the paper and hassled with the tape, anymore. The charges are moved to a report, the receipt is attached, a few other details are filled in, and wha-la - the report can be submitted. The one area I’ve noticed for improvement is the use of Uber. Depending on whether a driver is tipped before or after a trip is marked complete by the driver, one or two expense charges will show up. Uber does send two receipts in this case - but the proper one for each charge is a bit difficult to properly identify on the Mobile App; this is much better done on a desktop interface. Overall though, my company moving to this system has been great for productivity and efficient use of time. Mobile app easy to approve. When the hotel search works, the tool is nice, but about half the time it hangs up and I can’t see what hotels are available. The app is great but So slow is impossible to finish a report on it. PLEASE FIX IT!!! Each time I use Concur Mobile find more and more perks that are making my travel time more productive while staying organized on expense reporting. The “Send to SAP Concur” function while receiving PDF statements is awesome! I’ve been using this app for a week now and had no issues. I didn’t use this app till the end of my trip and I regret it. Simple and easy to stay organized not to mention easy to use. This makes reports very simple and easy to complete. Comments don’t usually update to the program so I have to go into the website and add comments. Very frustrating. New version create report only lets you cancel when creating a report. All info lost. Ridiculous. Pls fix. *** update: I finally saw the Done button. It’s there, but very faint as some genius made it blue font on slightly darker blue background. Still ridiculous, please fix. Extremely buggy and highly disappointing. Good ease of attaching receipts. Very slick timesaver. I would give this no stars as not being able to sign in or reset my password is complete failure. Also, every nickname is taken? All SAP users speak Hawaiian, eh?Highly doubtful. This is costing me a lot of time. The expenseit feature is critical to speed up processing receipts. Additionally if a feature is going to be removed it should be documented in the update notes. This did not happen! The expense amount field needs an auto decimal point. It’s included in other parts of the app, but not in the expense amount field. Very annoying since it takes time due to mis-keyed expenses and inaccurate entries. Love the app, however, biggest complaint is turn-around time on initial audit/approval by concur. Recently taking up to 4-5 days for concur audit review. Please provide a way to save allocations for future repetitive use. The app is much easier than login online via computer. Takes the headache away. After new update the “business purpose” line almost always deletes your entry, making you have to write it out a second time. If you upload a receipt or fill out any part of the expense first it makes you refill out the “business purpose” line about 100% of the time. Easier than the online platform. The app is easier to use and a much clearer experience than the online interface. Getting error messages when creating new Expense reports and uploading pdf messages from emails that Concur can’t resolve. Good app. Expensing hotels receipts for multiple night stays are tedious. They continue to make it easier to complete an expense report. Love this app! Makes expenses a breeze!!! I have had no issues doing my expense report every month and now it’s not working. I have tried deleting and reinstalling the app and nothing. I can add my expenses but when I try to create my expense report I’m getting an error now. How am I going to submit my expenses when the app is not working? The app doesn’t allow for choosing a location for a rental car. This has been a long standing problem and the new update does not fix it, contrary to their claim. Utterly useless app. This app works extremely well and is one more tool to make a mobile workers job more efficient. I was reluctant at first but was quickly win over by the intuitiveness and how automated most tasks had become. Stable and easy enough to use. Room for improvement with features like an option to move an expense to another report. Camera is also really sensitive with previously folded receipts. When you use the mobile app, if cautions you don’t do things or “it may not save”, why does it not always save? If you use eBay to do a listing, it constantly saves as you do work on your listing! We access Concur via OneLogin. It would be great if the app gave you the option of using your thumbprint to sign in - my credit card’s app does that so Concur should be able to do that as well. Concur now puts oldest charges for each day on the top instead of going bottom up like before. I put things in as I charge them each day and it was so easy to keep track of before. Now I feel like I might miss something because it works down now towards the charges from the day before. If it isn’t broke DON’T FIX IT! New update has slowed the app down considerably! Taking one minute per receipt. Where did personal car mileage expense category go? There is one listed with the same number 70420, but no option to put in addresses for the route taken. I tried the app support link, but couldn’t find anything about this. 1st time submitting expense report Entirely on my phone! Can’t believe how easy it was to submit my first Mobile expense report. Interface and simplicity are fantastic. Made it so much easier to track at time of activity and love using the receipt capture capability with the camera and absolutely love the integration with AMEX we have. True time saver. App doesn’t show a place for miles anymore and it’s not updating totals correctly. Balance on app is different from online. I have had to take pics on my phone because after taking via concur I have seen too many disappear. Very frustrating having to call some random restaurant to try and get a receipt. It also takes forever when I open the app and does the same every time I go back into the app. how can i give zero stars? stupid app.. never connects to my office account. but i found it very useful whenever it connects. This app is amazing and saves tons of time compared to the website version. I can book flights, hotels, cars etc and the expensing is a breeze. I travel all the time so this is a huge time saver on my phone and like I said it saves time vs desktop! One issue has come up recently though. I now search for flights (to big cities at normal times) and the search results show nothing. I know for a fact there are flights to those cities at that time but nothing populates. That means I have to do it via desktop and that’s a big time waste. Help!! Excellent App. Very user friendly! Nothing difficult in this app. Everything is self explanatory and easy to use!! Receipts now able to be completed by app. When Concur is up and running, it works well and is pretty intuitive. I do feel, however that the app is down maybe 20% of the time. My usual workflow is to take a photo of each receipt on each travel day but to create expense reports once per month. Concur doesn’t currently have features to support this workflow very well. Some or all of these enhancements would help: (1) bulk selection of photos in iPhone photos app to add to storage area of an *expense report* - ie not the general receipts area. This would allow me to scan all my photos from a given time period, select all that are receipts, store them with an expense report. So as I work on adding expenses to my expense report the default location for expense photos is this storage area (2) ability to set start time / end time for a given report - when I want to add photo receipts from the photo library - then default to those photos taken within that date range with option to see photos outside that range (3) if I fill in the actual date for an expense report then default photo library location to photos taken on that day + next 2 .. (4) ability to select a set of photos in the photo library and then have concur receipt library appear in the list of destinations where I can send photos to I hope these ideas are helpful!! Concur does not include remote city listings, LaGrange GA? This is the only expense reporting app or system I have ever been able to truly do 100% on my phone . My only complaint is that you cannot add multiple receipts at once - you have to add one, save it, then choose ‘view receipt’, ‘add another’, and then attach another receipt. For reporting purposes in my industry, I may have 2 receipts and 5 sheets of documentation that I have to include in the receipts section. Very time consuming - I would LOVE to just be able to add them all in one fell swoop. Need it for work. Does a great job! Training and use of the app and online tool are ridiculously easy. Don’t consider getting Concur if you don’t want Expenses to be fun, accurate, supported, and streamlined for all stakeholders. Thank you, Concur! Very intuitive once the user has all of the company required data. Cannot take a photo of receipt and add to expense. Cannot append receipt. Never happened all 4 years ago. Used to love the app but in the last couple weeks it has lost a bunch of receipts as has the web page. Grrr! The app does what it is expected to do. This is the least we should expect from an non-human app on a inanimate device. Che and test with users before adding any updates. Cant create a new report in IOS??? I have used this app for years and latest update doesn’t allow me to create a new report! FRUSTRATING!!! Update says this will be “easier” but I have spent 30 minutes trying to figure this out.. I love Concur. I’m going to dress up like the icon for Halloween. Previous versions were good. But now it takes 15-30-45 minutes for emailed receipts to show up. So long that I think something went wrong. But then the next day they are all there. Love that it doesn’t crash anymore when I have to back out of the app for something. Also love the new receipt camera - much easier and less painful. Nice and easy to use. Import function is very useful. Only recommendation I would make for the application is having the ability to break out multiple hotel nights that have different rates (which happens often). Not the end of the world because you can still work with arithmetic by dividing by the number of nights equally but this method leaves inconsistencies when it comes to corporate audits as the actual nightly amounts don’t quite match. All else is alright..
Wow! An expense app that allows you to easily process itemized hotel receipts?! Next they’ll be offering pre-sliced bread...doesn’t get any easier. This app is makes keeping expenses managed. The only reason I didn’t give it more stars is I’ve found not all the receipt pictures are posting and they are not saved. The camera should post to the phone memory. Please add “frequently used” attendees. It takes 10 clicks on the app to add myself to each lunch. Just started using this app abouba week ago. Seems ok, miles don’t always match what’s been driven. It would be nice if it gave you a daily total so you don’t have to add the trips all up manually. The app crashes immediately after the splash screen. Completely unusable. The app is great and it allows me to process instantly rather than all at one when I get back to the office. It’s also very easy to navigate. Concur used to be really had to deal with from the app, but my today’s experience has been great- a smooth ride. Thank you! The mobile app is great to capture expenses on the go and make modifications to existing expenses. However, I find I need to use the website to move and expense to the proper report. It is frustrating that you cannot book a car to pick up at one airport and drop off at another in the app. Great, very easy to use. The program is great and easy to use once you get the hang of it. The approval process has been getting worse. Taking too long for the auditor to approve. Sometimes over a week! Simple to use.. Still crashes while attempting to attach receipts. Requires relaunching the app.. The system is great. One improvement should be on the ability to attach email approvals. Definitely a time saver vs filling out paperwork. On the other hand, the account and reviewing process has been slowing down at a trending rate. The app alone is easily a five star. The process of reimbursement is definitely a -3 however has potential for a five star. UPDATE NEEDED WHEN SUBMITTING AN EXPENSE REPORT. I’ve been trying to submit my expenses for nearly a month now, and every time I went to go submit my expenses. I would be pulled to a screen that appears to have no way to progress forward BECAUSE the ‘Create’ button is camouflaged to nearly the same color as it’s background. So hitting cancel appeared to be my only option, UNTIL today when I just said screw it and touched that area of my screen and it submitted my report. Please do us average folks a EASY favor and change the color of ‘create’ to white, or a color that doesn’t mask itself with the background. Other than that, great app. Fix this and it’ll be perfect. Thanks! All of the changes on this app are pretty much a disaster. Looks like the test this in perfect conditions to get the all clear. Business travel is anything but a perfect world. This app totally lost 3 receipts. My expense report is a disaster because it keeps trying to do everything for me. If there was an “I hate it” button I would give it several. Capture the receipt like you used to do and be done with it. If this can’t “scan” the receipt and get the total it dumbs the receipt and you are totally screwed. Feedback does nothing to make changes. What a dog app. Terrible. My company has been using Concur forever. Every time I enter a rental car expense I have to enter it twice before the app accepts it. For expense type you will select what you want and then it bounces back to undefined. Every time you click on expense it takes 10-20 seconds for the expense to open. This makes my expense reports take forever. And it’s been like this for several years now. Please, fix it. This app is okay.. In this day and age it is beyond me that we cannot query an expense by the value or name. Cities that exist are not in the concur data base making it impossible to manually add. MY BIGGEST COMPLAINT IS IF TOU ATTACH A RECEIPT YOU SHOULDN'T HAVE TO CHECK THE BOX THAT THE RECEIPT IS ATTACHED!!! That’s the main reason for 3 stars. I could go 5 stars if these reasonable feature suggestions are added. App takes too long to submit reports on. Receipts don’t always transfer, costs a lot of time to redo them. Itemizations take a long time to correct when the app tries to auto populate them. I never received my password reset. Very convenient but why when I have a meal don't you allow me to add the type of meal like breakfast. My company requires this info. Plus why can’t you get location to work and why do I have to choose Camera for every receipt? App does not tell you that you need to change your password so when it expires you don’t know unless you go login on a computer. This my be the worst app I’ve ever used. I’ve spent a half hour trying to figure out how to use this stupid app and I still can’t get my expense submitted. Are you trying to make it hard so our company can avoid paying our expenses? Website logs in fine, app always sets password is wrong. Would love to rate but can’t even login! App crashes on iPhone X. Completely useless now. Can’t get beyond sign on/login. Continues to give error message that password has expired, which isn’t the case because the desktop version works just fine. Here’s the thing with concur. When it works, it’s amazing. But at least once a month it goes down for a week or so and doesn’t allow you to access your charges, expenses or pictures. It won’t even allow you to upload receipts via camera. So doing expenses could be frustrating and time consuming. Extremely time consuming. This app is not consistent or reliable. This app would be convenient if it actually WORKED. If I want to add multiple office staff as an attendee, by typing in the number, the option disappears for no reason. You have to click through too many options to complete one task. Plz stop making unuseful updates. It’s enough. Until recently, I was using the expenseit app to import my receipts into concur. That app no longer works, and displays a message saying to use the concur app. The concur app is slow to add reciepts, and adds then into concur not as available expenses, but simply as images that are not analyzed at all. I have gone from an app that is significantly faster and easier than the old excel sheet with paper receipts to one which is significantly more difficult. Won’t go past the title screen. I’ve used it in the past and it’s good but how I can’t open. All other apps on my phone work currently. Please fix. Doesn’t work. I can’t even press the ‘next’ button at the bottom of the page because of how the screen is formatted. Once again the app won’t open, it wants my password then says server encountered an error. This has been happening quite a bit since the last update. Very frustrating and annoying. The old app would open quickly and I could do an expense right away. This app is slow to open. Painfully slow! It also has lots of bugs: Sometimes expenses that I created will just disappear and then show up hours later. An expense that’s been edited but hasn’t been saved will show a “move to report” button on the bottom that doesn’t work. You have to save the edit first and then go back to it and move to the report. Why show a button if it can’t be used? An expense created in ExpenseIt will show up twice and then disappear later. Location doesn’t have a current location option. Way too many issues with this app. These are just a few. Crashes every time I open app. Is there an issue with the app, it crashes every time I open it. Just downloaded it and redownloaded it also. I’ve had this happen to me multiple times where I take a picture of a receipt, type out all the details, and save it, and then the receipt disappears for the day and then pops up days later when I try again to do my expenses. Very frustrating and has been causing me to be late in submitting my expenses! Just downloaded the app but I can’t even get past the initial log-in!!!! Tried to log in with both options - my work email or SSO company code - and either way it shows me a white screen and doesn’t proceed anywhere after. Waste of time and energy. Since most recent update app crashes when accessing trips. Makes the app useless. When we were using ExpenseIt to capture receipts, the app loaded quickly and was ready to snap a picture of the receipt in a second or two. The concur app takes up to 40 seconds to launch and authenticate before I can snap a pic of a receipt. It also seemed to incorrectly indicate processing progress when processing receipts. I just want to launch the app and snap the receipt in a couple of seconds and get on with my day. This is about the only use case I use the mobile app for. I do my reports and approvals and travel via web. I prefer that form factor for those activities. Extremely difficult to use on new iPads due to the screen size pushing buttons off the screen. I am now upgrading my review to 5 stars. The issue with the newer iPads has been fixed. Wonderful app for doing my business expenses. I avoid my companies web interface due to itis difficulty and just use the app these days. Always being kicked out and forced to reset password which never works. Process to use two fingers to select server which always defaults back to concur server is horrible. Unable to create itinerary on app?? The new update doesn’t have an expense option anymore. It just tracks my trips but less of TripIt’s perks. App is good. However, I have a iPhone XR on iOS 12.2 and notifications will not work. No matter app of phones settings I adjust. I shouldn’t have to validate the price and confirm the image twice before submission. 3 additional clicks makes me miss the ExpenseIt application. Just take the receipt picture and submit, what used to take 2 clicks now requires multiple seconds for session authentication, multiple seconds to open the camera, and 5 clicks to submit a receipt. Each time I open the app it crashes. I have iOS 12.1.4. The app fails to recognize my account, yet the website works fine. Makes it very difficult to submit receipts. The app won’t allow me to search hotels because it does not support per diem hotel rules, making the app worthless to me. This used to be the most solid app. Ran smooth, successfully captured receipts etc. suddenly it tried to get fancy and scan my receipts and it turned into a disaster. It is now one more thing I have to worry about in a day whether it’s going to just keep the receipt or try to make its one expense and is wildly off. I had a meal for $43 the app scanned at made an expense from a clean receipt into $51. Once you delete it tosses the receipt image as well. Oops! Go back to older version please it worked just fine. Don’t do and he’s to much. It’s like apple maps a dud. Love the getting rid of paper promise. Have been meticulously uploading receipts and it shows successful uploads but when it come time to submit expenses, the receipts are all gone. App works great except cannot get it to “save to iPhone photos” when using Expense It feature. Please fix. This app always seems to let me down in one way or another. Something new is always not working correctly. Don’t update! (If it’s not too late). Latest version is broken! When importing receipts and manually converting to expense, the expense disappears. This latest update broke the app and now it’s practically unusable for many expenses. It would be nice if there was support for importing PDF files as receipts. It’s a pain to have to print the take a picture just to import a receipt. Used to be a very good app, but it appears they have reached their level of incompetence. Turn around and go back a step or two. My expenses that I manually enter do not show up, receipts are disappearing when photo taken with app, and expense assistant/expense-it functions are crap and don’t know why anyone would want to use them (I guess that’s why u enable it without permission and make us search for how to turn it back off)...NOT liking it now, if it wasn’t my companies preferred app, would have deleted it by now. This Application is a very efficient means to keep track of your travel and daily expenses. I have not yet had 1 issue while using it. I LOVE it! Thanks to the developers and people behind the scenes! Don’t trust the pictures you take of receipts with this app. Sometimes receipts you take pictures of will not be attached to expenses and you fill find yourself looking through piles of paper receipts to upload some of them again. The app is convenient and easy to use however the updating process of the exceptions are slow to refresh. Literally nothing saves when typed in. It just blanks out what you type into a text box. Don’t waste your money on this trash. SUPER SLOW!! Needs to be faster to be effective!!!! The app is a nice idea, but it takes 10-20seconds for it to process each step (and there are 4 steps to enter each individual receipt). Needs to be quicker!!! It shouldn’t take more than 5 seconds to completely enter an expense and assign it to an expense report. Can’t log mileage. That’s what I need concur most for. Please update with that feature. Heck, partner with google maps or something and let it access location and confirm for daily mileage. Then this would be a 5 star app. The website is great, but it would be nice to go along with the day and add data in. Fast and ez to use this app . It tells you what you are missing . Concur has been awesome for so long, but the recent update is a pain! Please fix it so when you go to the camera roll to upload a receipt, it puts the most recent pictures at the top and not all the way at the bottom !!!!!!!!!! Fix the way media is handled for pictures when attaching receipts via photo album. Have the most recent pictures at the beginning. You can’t book one way car rentals from the App. Usability has deteriorated. Too many clicks and screens. The ascending/descending column selections on the expense receipts screens don’t work. I appreciate that you continue to improve the app to make it more user friendly and fast to do expense reports! I don’t like that you can’t group expenses to a charge code and instead have to apply to each and every one. Over all it’s a good app. But, when you add a receipt from camera roll it defaults to the first picture in your album. Gets frustrating when you have thousands of pictures to scroll through to get to the latest one. Everything is super user friendly except when I add a receipt from my photos, it defaults to my camera roll from the beginning instead most recent so I have to spend three or four minutes getting down through a lifetime of pictures before I can add the receipt. Can that be fixed? Single sign on does not work after update. Concur is great and saves huge amounts of time. Only caveat is that one has to disable the receipt scan function. In this case AI stands for almost intelligent. The feature will waste untold amounts of time but once disabled entering receipts manually is easy. Another case of trying to fix something that isn't broken. Photos for attaching receipts should be most recent first. Right now I have to scroll through 20,000 pictures to get to the recent photos. Additionally, photo analysis should work on every bill so that I don’t have to manually enter itemization. Joyce was awesome ! She patiently walked me through every step to submit my report as I had not done it before which took 35 minutes. Thank you Joyce! Easy to use. I know I can filter by hotel name but I wish I could filter by loyalty program. Had to crop several times before getting proper image. This is not a problem but the error msg was ambiguous. Also nickname required is redundant. Extremely difficult to use on new iPads due to the screen size pushing buttons off the screen. Does not work well on iOS 12 and new iPad. It used to be useful but now cannot perform basic functions. Love the App. It so easy and convenient to use I am able to submit my expense report on my way home after my travel. No more delays in getting reimbursed. User experience is significantly worse on this app when uploading photos of receipts. A massive pain just to upload a screenshot of a receipt now. Can’t select multiple screenshots at once to expense. Bring back the old app! Use your phone to take a picture of that receipt and write your expense report as you go. Minus one star due to photo library browser. Should be most recent on the top. This app has been great until the recent releases. When attaching a photo from the photo album for a receipt, it goes to the oldest photo! Fix the sort order and back to 5 stars. It’s unusable with the current sort order. Now I have to cycle thru thru all my photos to attach a receipt because you decided to change the attachment method so instead of most recent photos showing first the oldest photos show which means I have to scroll thru 1,000 plus photos just to get to most recent. Then cropping ability limited then if you make a mistake and go back you need to cycle thru all photos AGAIN!! What a lack of common sense change. There was no reason to change this!!! Uploading receipt from phone gallery become so much difficult. I’m not sure how it works on other platforms but on my ios 12.1 the gallery starts from the very old so that I have to scroll all the way down to access recent pictures. That has to be changed. Very easy to use app. Snap a shot of your receipt as soon as you get it and you’ll never loose it. It’s in the system and ready to go. Easily make a suspense report and easily submit it. Simple as that. Love it! Interface needs to be fixed with new iPad Pro 12.9, missing multiple buttons and can’t use at all. New version create report only lets you cancel when creating a report. All info lost. Ridiculous. Pls fix. *** update: *** 21 Nov 2018 I finally saw the Done button. It’s there, but very faint as some genius made it blue font on ever so slightly darker blue background. Still ridiculous, please fix. Still not fixed. Make Done yellow or any other color than the background! *** 21 Nov 2018 Latest version add receipt from Photos goes to first photo in camera roll. I have 1200 pics on my phone. (3 min to scroll to last pic of receipt) How about going to the last pic instead??? Why would you ruin a good thing? Used to love this app, but now when you need to pull up a receipt from your album to upload - it defaults to your oldest photos?!?!? Omg what a waste of time scrolling back 10 years, please fix this! If you submit feedback on their website they respond with “you should not have to upload a receipt from your photo album, you should snap and up load” well sometimes you need to grab from the album <— hello! Confirmed login works on the web but every time I try and use the app I get a network connectivity error. Have tried on many different networks including t mobile, Verizon and wireless in various offices and still get the issue. The app takes a long to load an expense report. The creation of a new expense report is not possible in the app as it does not search for sales order item and times out, even on high speed wifi network. Concur is great once you learn how to use the app. All aspects of the process are simple and efficient. When I capture a screenshot of an emailed receipt why does the app sort by the oldest photos as opposed to the most recent. I can’t even change the sorting method so I have to scroll past 16,000 photos to get to my receipt. Please fix this. So easy o feel like I’m cheating! With ExpenseIt now part of this app, improvements must be made. The app need to load faster. The ExpenseIt portion needs to work exactly like the stand-alone ExpenseIt app! Manual changes in expense type must be saved. Much work to be done by your development team, good luck! I really don’t want to go back to the stone age. When looking for receipts on the photo album feature, you now have to scroll through your entire album to get to the latest images. Please fix this so that the newest photos are at the top of the album view. When I want to submit a receipt to Concur I like to use ExpensIt. Unfortunately the ExpenseIt standalone app is going away and now I’ll be forced to use the Concur app to record receipts. It takes several times longer to use Concur for this purpose. ExpenseIt is far superior for taking a quick shot of a receipt. There used to be a mileage option for expense type in mobile app. Now with new update no such thing and I'm forced to use the website. I’ve been using the iPhone app for 2 years and it works well. The iPad Pro version fails. The screen layouts are off, so that you cannot use the back navigation or cancel buttons properly. The layouts get offset so that the view starts in the middle of the screen and you cannot see the top part of it. This app has very poor QC on the 2018 iPad Pro screen sizes. I would like to send these screenshots to someone at concur, but it is not possible to get a straightforward way to email them feedback. Great app for work. iPhone is amazingly well implemented. iPad Pro - pretty rough with elements of the UI off screen, unable to approve expenses that I can in safari mobile. Use the app on the phone but just use safari on iPad Pro is my best experience. 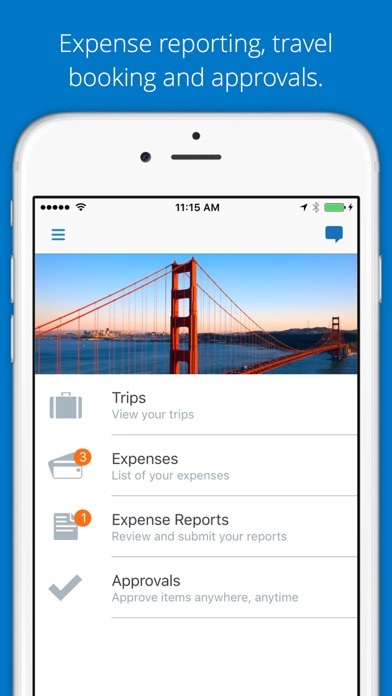 Concur is the gold standard for expense reporting. Other apps are not better, just cheaper - and you get what you pay for. This is a great app but it needs to be updated for the new 2018 iPad Pros’ resolution. Approval buttons on the bottom of the screen are cut off only showing about an eighth of an inch of the top of the buttons - can’t even see the labels on the buttons. The app is quick and easy to use!! This app makes doing your expense reports and traveling needs very simple. This is a great program but the latest update is not working right. Concur has not updated their software to include the larger screen iPad Pro 11in model. Completely unusable! Fix! Wonder, why someone would refuse to use this as opposed to doing it on the laptop? 5 minutes versus at least 20 in the PC and more on any reimbursement system. Easy to figure out, first time doing mileage, took 5 min. I do not want a passcode on my phone. Remove this requirement!!! Love the app! Makes my life submitting expenses less cumbersome! Very disappointed with concur. Waste time and money. App issues - add Receipt from library. The Concur app has been improving, but there is a major problem that makes it almost unusable for some of my expenses. When adding a receipt from the photo library, the oldest pictures are displayed first. You have to scroll past all the pictures on your phone to select a receipt image that was recently taken. Concur also lacks end user support. It’s frustrating not being able to talk to a person about issues like this. This app worked great until the latest update that causes the app to look back at my earliest photos from 10 yrs ago. Needs to be fixed! There is a bug in the latest update that opens your photos on iOS at the earliest photo you’ve taken. If you screenshot your receipts it means you likely have to scroll through thousands of photos or find a different folder to save your photos in. Huge pain, please fix. Easy to use and fast! Unable to open app. Crashing during launch. Reviewing the expense functionality specifically - When trying to attach a receipt from photo album, you are presented with images in chronological order, OLDEST first. Reversing it doesn’t work. It’s not feasible to scroll through tens of thousands of photos, so the only work around is to start a new album each time you have receipts which is a bad solution. I rely on concur to sort out my business travel expenses on a weekly basis. However after the latest update, they decided to reverse the picture sort, so if your phone has 5000 photos and you’ve taken a photo of your last receipt to upload, you will need to scroll through all 5000 photos to attach one receipt to your report. Please- SAP Concur- think of our thumbs! There is only one word to explain this application: Greatest!! When trying to add a receipt from my photo album, the album now starts at the top. Quite the inconvenience having to scroll through a couple thousand pics. Otherwise the app is great. When uploading a receipt why would you sort the camera roll by oldest? New update makes the app unusable. 60% of the times there are errors submitting receipts. If this wasn't the case it would be awesome, but whats the point of doing a report on a app, if you have to submit receipts thru the website. Once you get use to it I was comfortable. Like anything else, it’s just getting use to it. When the app works, it’s ok. Unfortunately, there are too many times when it doesn’t work/fails to load etc. It’s glitchy af. Currently telling me to check my network connections even though all my other running apps are having no problems. And don’t get me started on the web version of concur. Orbitz was much easier and significantly faster. Up until a few weeks ago, I would have rated this 4.5; however, a recent change to the app took its interface several steps backward. There’s now a clunky cropping step that isn’t necessary, & the interface with the Apple Photos app has been changed, forcing a user to hunt thru their entire library to find the pics of their receipts. 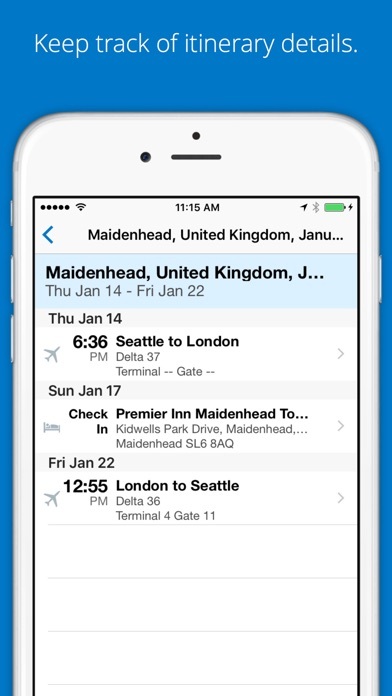 Concur travel and expense app. Have been using this app for years and it’s been great. Sadly, with the most recent update, the photos sort by oldest first rather than most recent first. This is rough when I have thousands of photos on my phone and have to scroll all the way to the bottom. PLEASE revert back to having the most recent populate first! Great app that makes my expense reports super simple! The app is getting slower and slower each time I use it. At this point I can’t even log in, but the error message points to connection issues. The same connection used to post this review was used to attempt to log in. The latest update has made the app unusable. No ability to upload receipts. And, can’t see any reports. Also sharing this info with our AP department, time to leave Concur. Can’t login. Get message that my network isn’t working. Nope my network is fine. Really would like to finish my expense report and all receipts are on my phone. NO OPTION TO UPLOAD RECEIPTS ANYMORE ? Latest update took this feature away!? I need it back plz! I will update the rating when it comes back! Until then it is a 1 star. Easy and time saving Apps. Trying to add a photo of a receipt. But SAP only has morons work there... so of course when you pull up the Album it defaults to 10+ year old photos, and then you gotta scroll all the way to today. No shortcuts. I had the pain of using this service for 7 years now, never improved, and just like Ariba SAP puts out only garbage products. Route on mileage expense doesn’t work. Unreliable... Here are just a few odd issues... I select the date and time and the correct date and times are selected, but when I return to continue filling in the rest of the info, the time is showing wrong. When I click on the date and time to adjust it, the correct date and time is showing. But when I exit to continue with the booking, wrong time is showing. This is when trying to book a train. When I am trying to book a train and go to select the departure date, tomorrow’s date is showing as today and today is showing as yesterday. Totally bizarre. To explain, today is December 12. When I go to select tomorrow’s departure date, which would be December 13, it shows Today, then December 14 as tomorrow and December 12 as yesterday. I have never seen this issue with any other booking app and trust me, I travel a lot. I constantly get Internal Server Error error message so app is useless when trying to book anything. I only use it to check on flights I already booked. Despite showing the trip information under that category, you cannot include trip information in expense reports created on the iPhone. Good for capturing receipts but you will need to delete and re-enter it anyways if you have any trip information that needs to be included. Hopefully the app will mature as they continue development. This used to work well but it’s crashing upon opening with my iPhone 6s, most current IOS. Hope it gets re-stabilized soon. From the time you click the app to open it to actually taking a picture of a receipt is about 2.5 days. I timed it on a stop watch. If you accidentally click expenseit on a receipt image, it just deletes it with no warning. This saves a step if you are actually trying to delete an image. If you needed that receipt, just call the vendor and see how easy it is for them to send you a copy. Likely 2.5 days for that, on average. Great app but it needs to support the screen dimensions of the new iPad Pros. At the moment, most of the bottom section of the app is cut off outside of the tappable area of the screen. Hope the next update resolves this asap. Just updated the app and it won’t even open. Ridiculous. Why are photos showing from oldest to newest? I need to scroll through all photos to get to the most recently taken photos. Please fix. I rarely write reviews: either when it’s amazingly good or horribly bad. This is just a heads up to developers that there are some issues with the UI using the new 11” iPad Pro. When switching orientations, the app appears to “shift” in the screen, making it impossible to reach some buttons. In general, the landscape orientation feels “zoomed” in where I can’t reach a lot of clicks on the edges; important ones to close out windows. This is a truly poor application. Hard to use, and full of bugs. In fact, the only reason I use Concur at all is because my employer forces me to. I never thought I would miss the days of submitting paper expenses by hand, but Concur has done it! Great App, very user friendly! I don’t understand why the app could use my thumbprint to login on the iPhone 8 but can’t do Face ID on the iPhone X. So annoying. Overall it’s a good app, but in a recent update it changed the “upload receipt from camera roll” feature to where, when selected, it takes you to the TOP of your camera roll. Super annoying since most people have THOUSANDS of photos in their camera roll. Please change this so that it takes you to the bottom of your camera roll (most recent photos) when selected. The current update to this app sorts all photos, where receipt images are stored, oldest to newest so I have to scroll through every picture I have ever taken to find my most recent receipt. Really really frustrating! Need to be access travel info even if app is offline. Upgraded from iPad to the new iPad Pro 11 2018. Menu for submitting, or attaching receipts to expenses are impossible to get to. Haven’t tried to book any reservations yet as it was to frustrating to go use the website instead on the iPad. I hope there is a fix for this soon. Scroll through 20k photos in my album to get to the latest screen cap once more, i'm deleting the g.dam*ed app. Single sign on still not working. Simple and easy. The process is smooth and I get my reimbursement check super fast! With each update of the app, the Concur tools keep getting better and better! Easier than using computer program! Nice App! It just takes way too long using Concur when you have a lot of expenses. Touch ID no longer is available. Very very easy, efficient & quality app. This is a must-have for anyone that does expense reports. And own a smart phone device. I have an iPhone X & it works wonderfully. Highly recommended must-have app! Great Job Concur! Everything about this app is truly awesome. Easiest app to use and the most convenient way to submit an expense report EVER!!! Where did Touch ID go? Hugely inconvenient to type in password each time. Not integrated with password management app. I've never used an expense app that was a good experience. Concur is the least worst one I've used though. Solid 3 star app right here. Easy to use! Very clear & the app always works. Much much easier than the old way with a pencil and a form. MUCH easier and quicker. Been doing expense reports for 40 years and it has NEVER been this easy before. My expenses are so much easier now using this app. Welcome to the future! What happened to Touch ID?? Latest update somehow no longer allows you to log in utilizing Touch ID? What’s up with that? Quick, easy and very user friendly! A great tool to keep track and monitor expenses! Concur Mobil app is so Convenient, Quick, and easy to use. Anyone not using it must have time to burn. Typical SAP app. Can’t see history, can’t see active reports after the update. One would think a company with the resources of SAP could manage to keep an app running after iOS updates. Nope. Yet you tell customers and prospects that this is a BENEFIT of using SAP for EVERYTHING. Laughable. Indeed, laughable. I don’t know why but application starts Chinese. And can’t make it other language. It'd be nice if you could do multiple days for meals since it's usually the same amount. Maybe you can, this app is new to me. My entire expense report is done on my phone now. Just wish the app could keep up with me better. Have to renter info twice of you don't give it time to catch up. This app makes the process so much easier since you can submit reports on the go!! I can access my friends, but game freezes as soon you go into their community. Also, I’m unable to delete friends to add new ones. Lately app is useless. Not one feature works correctly. Great app - very easy to use. No more finger password ? Why there is not more finger password insted you need to write the password ? Can’t create new expense report. Can’t add photo receipts to the single expenses. Constant struggles with this app. Time waster. Love the function where you can attach receipts via camera. Much easier than traditional way! Makes it very easy to manage expenses and book travel. Stop “enhancing” the app and start fixing it. If we use your app it’s because our company partners with you. So fix the stupid stuff like right now I need an internet connection in order to enter an expense. Really? You hadn’t considered I might not have internet? Using the app is easier and faster than doing my expenses on the web based version. The mobility to the Concur program is awesome. I’ve only found one issue...during each report created. When I go into the expense to give details for the business purpose, well I’ve noticed that I must input twice. On the first attempt, I lose my input. I’ve learned to copy my first input, so I may paste it for the second time due to program omitting my input. The receipt time stamps appear to be based on server time or something else, not based on user location. I just took a receipt photo at 9pm in CST and it shows up as tomorrow. Not gonna work out well when I go looking for receipts to pair up with expenses later. Please fix. Thanks. Easy entry of expenses while traveling. Very easy to use no hassle. Most of the time the Concur App works great! 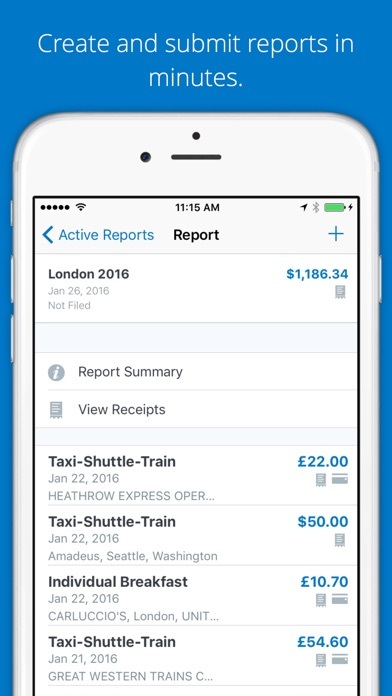 It’s handy, fairly intuitive, and allows me to clear expenses and approve reports on the go. Lately, however, I’ve gotten a regular message saying there’s a system failure and I need to inform a onecard administrator (not sure who that is). I’ll make a few attempts to reload the data, or close out and login again, but it doesn’t help. There’s no apparent reason for the failure. But, if I wait a few days I can go back to the site and it works. So sometime it’s inconvenient and makes for more work. You have phases out ExpenseIt, so I now must use this app. However, this app does not work. When I log in with my email I get a blank screen, and can only go back to do it again. What is the fix? This app won’t even let me open it. Have very hard time doing anything on it since I can’t get in. Expensit made submitting expenses very quick and easy and I liked that it was separate to the main concur app, which was always sluggish and confusing. Now that it’s rolled in, expensing is much slower and cumbersome. App is slow to activate camera and recognition of receipts is back to years ago. I wish it had been left alone! Can’t do a multi-segment flight on mobile app. When I use Concur on my 12.9 iPad Pro, each time I rotate the iPad between portrait and landscape mode the app itself moves further from the physical bottom of he iPad (the side with the USB-C port. The position of the app on the screen shifts so that I get a growing black band on whichever side has the port, regardless of orientation, and any controls opposite that side move off screen. With expenseit killed off, please add concur as an option to the activities menu that one receives after taking a photo. With expenseit, I could simply swipe up to turn the camera on, take a photo, and select expenseit from the activities menu and the receipt was auto uploaded to concur along with fields auto filled. This is no longer an option now that expenseit was killed off. Please add this feature back. It is so much faster to be able to add an expense “on the fly” as I describe than it is opening the concur app each time I need to do so. It seems that PDFs have this option for concur on the activities menu, but not photos. Why in the world???? As numerous other reviews have stated, the latest update basically broke the app. It crashes every time I try to launch it. Uninstalled and reinstalled; no change. Updated iOS to latest version (12.1.3 on iPhone 7) and no change. Months later, still the same: After new update the “business purpose” line almost always deletes your entry, making you have to write it out a second time. If you upload a receipt or fill out any part of the expense first it makes you refill out the “business purpose” line twice about 100% of the time. Updating my review to one star as this is still an issue. Whatever doesn’t autopopulate requires you to enter the information twice almost every time. It’s gotten to the point where I will “select all” and copy what I type so that I can just repaste it. Please fix!!!! On load app says I must set PIN in iPhone settings. That option doesn't exist. Absolutely cannot access this app. Bring back stand alone ExpenseIt app!!! Developers: I told you I'd do it. 0 stars if I could because you killed the stand alone ExpenseIt app. Here's why ExpenseIt in the concur app makes me mad enough to waste time writing this review. 1) I'm in a hurry to snap a pic of a receipt and keep hustling through my day. The concur app takes forever to open and load before I can snap my pic. Standalone was a smaller app, less functions thus opened quickly. 2) Since Jan 1 ExpenseIt in the concur app has lost my receipt on multiple occasions. 3) ExpenseIt in the concur app is not saving a copy of my receipt to my gallery even though I have that setting turned on. (See #2 these combine to be a big problem at the end of the week when I go to submit my reports.) 4) Today, it's flat broke, Take picture, you verify the amount, then it analyzes it and says there is no receipt in the image to analyze. Then it sits there with the error, so you can see it but you are locked out, can't edit the fields can't transfer the receipt to your report or do anything else with it. 5) Other receipt errors: constantly stuck in "analyzing", wheel spinning, repeatedly "uploading receipt" etc. 6) Initially not assigning any expense categories, that seems to been fixed over 3 weeks of use, or the AI has learned how to categorize my expense. 7) Overall takes too long. Move receipt to report, dumps you into report, now you have to back out of the report to deal with the next receipt, instead of right back to ExpenseIt or home screen to take next receipt image or edit/audit next receipt. Every one of these steps into/out of the report takes forever, concur wheel spinning as is syncs up to the server with each screen. That's all well and good for full on Concur app(when I'm ready to sit down, audit and submit my report at the end of the week), but when I'm using ExpenseIt I'm on the go and it needs to be quick, pull out the phone quick snap, put it away, not worry about it just know that my receipt/expense is safe and sound and will be there on my most current report at the end of the week when I'm ready to deal with that. That convenience the standalone ExpenseIt app offered has been lost in the Concur bundled version as I spend agonizing time every time I need to capture a receipt watching the wheel spin waiting for the full blown app to launch and lumber on to each next screen. On a positive note the other functionality of the concur app has improved since I started using it several years ago, you can probably actually use it for submitting your reports without being at a computer with the full blown web version now...Now, please find a way to make ExpenseIt work quickly and reliably on crappy old iPhones our employers will continue to furnish us with for work, even if that means you BRING BACK THE STANDALONE EXPENSEIT APP!!! The old ExpenseIt Pro app was great. Then SAP chose to force users to use this piece of trash as of 2019. It doesn’t work. It can’t read receipts. It crashes often and easily. Why? Why? Why? What a dumpster fire of an attempt at streamlining. Get bent, Concur. Mobile receipt uploads from photo album no longer works with most recent update. The app works most of the time, though I wish it was still just Concur without the sap. Doesn’t play well with ios, WHY? This app isn't compatible with the new iOS 12.1.1 and on the new gen 3 ipad pro 12.9. Concur refuse to admit they have an issue here and does not have any customer service support either. A very difficult company to work with. Concur has stumbled consistently. To this point Concur is hardly compatible with the new the new hardware Apple has released and they offer no apology for it. Most notably the screens on the Gen 3 ipad are most always truncated and make it extremely difficult to fully process reports. Furthermore, the extremely slow and minimally existent support has no clue this even occurring let alone what to do or even interested in engaging to find out the issue. As much as it is a tremendous idea what they do it is carried out by poor leadership that doesn't value their customer base. Buyers beware of the purveyor! Simply having the app available on the same device where the images of receipts have been captured reduces steps needed to submit expense reports, and I can do it without going to in to work. So that’s great. App is functional and fairly simple to use, performing solidly without flair. Rather disapponted in the removal of the receipt cropping capability since expenseit became integrated into the app. The app does not upload receipts to Concur and is very finicky. Have reloaded on my phone multiple times - very disappointed. So did expense it for receipts. Now, sap disabled expense it and broke the ‘SAP Concur’ app so it crashes on startup on my phone. Can SAP ever stop making my day difficult!? I long for the days of pure concur with no SAP. Have used this app to book most of my travel for a couple of years with very few issues. However, latest version on iPad Pro 11’ does not scale properly and some of the buttons are inaccessible. Getting stuck on a page with no way to close or move on, only way to fix is close the app. App is unusable in this state, please fix ASAP. App works well most of the time. Current version has sizing issues with new 2018 iPad Pro. Buttons are nearly off the screen preventing access to menus and difficult ability to select “approve report” or “return to employee”. Should be something relatively easy to fix. Since the ExpenseIt app is no longer supported it seems that sending screenshots of receipts directly to concur to be automatically read and uploaded is a not a function. This was a huge time saver. Taking a screenshot of emailed receipts and not having to save it as a picture and then opening the app to upload is an important function. Hoping update will incorporate this ASAP. Expensit made submitting expenses very quick and easy and I liked that it was separate to the main concur app, which was always sluggish and confusing. Now that it’s rolled in, expensing is much slower and cumbersome. App is slow to activate camera, makes you wait to login before you can snap, and recognition of receipts is back to accuracy of years ago. I wish it had been left alone! This app cannot be trusted to save receipt images. Sometimes it says it has it and it disappears. Other times it goes into an endless “uploading image” loop. This app used allow choosing images from your camera roll or library using the same interface as the native Photos app. After a recent update you’re only allowed to choose a photo from an unsorted mess. For some reason the first image to choose from is the oldest in your camera roll instead of showing the most recent image/screen shot. Please fix this! With ExpenseIt deprecated by SAP Concur at the end of 2018, I’m just now experiencing their replacement ap. They’ve gone backwards and made this process more cumbersome. 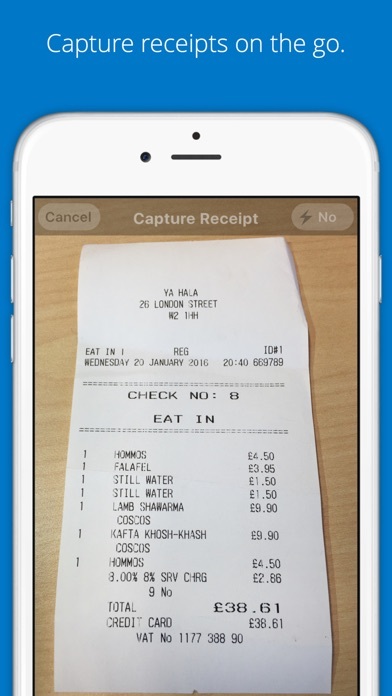 No longer can you enter a receipt with just a picture; you’re now required to manually key information in - no OCR. Easier than online Concur website portal. And the portal is already great. Plus, no more signing into the website. Enough said. An incredible and efficient app. Given the amount of money we and other companies pay Concur, it is really an embarrassment that the app is not better. Beyond very simple tasks like adding the bare bones information on an expense, the app is pretty much useless. Not bad, just I would expect something better. This is an amazing app, but I am running into some major issues with my new iPad Pro 11. The screen does not fit the app, and I can not fill out expenses as I need to. I hope a new update comes out soon to fix the issue.